A series where we highlight members of the SPD community. "SPD has been an invaluable resource for me. Whether it’s the networking it enabled me to do or the things I’ve been able to learn through lectures and other events, it is really inspiring being part of a community of editorial design leaders." SPD: What do you do? Rami Moghadam: I am an Art Director for ESPN’s Print and Digital Media Group, working primarily on ESPN The Magazine and ESPN.com. SPD: Where did you get your start? full-time Designer and eventually Senior Designer role with the company. 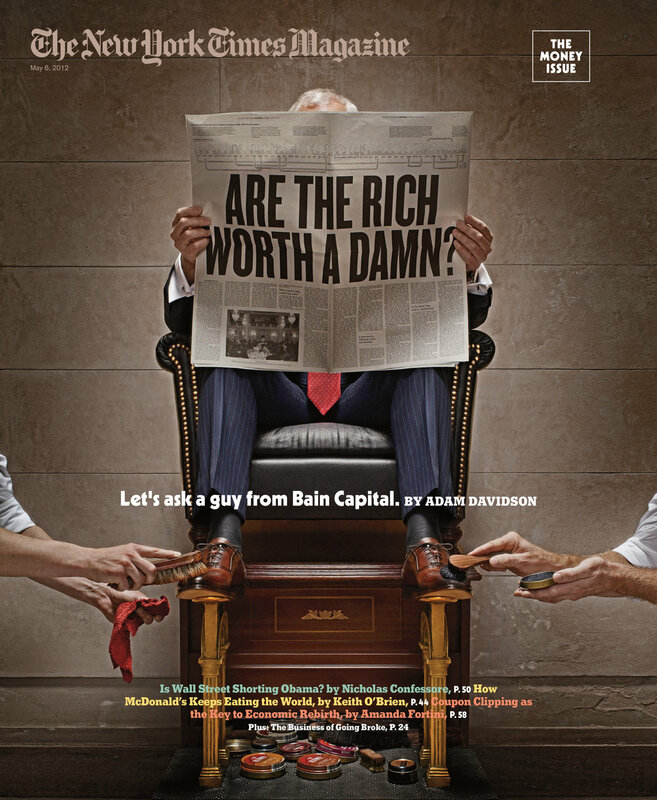 Luke deserves the most credit for instilling the love of editorial design in me. I went through editorial design boot camp with him: Luke and I worked on well over 10 redesigns for publications including Adweek, Consumer Reports, Cosmopolitan, Golf Digest, Tennis, and Vibe. After close to five years there, I decided I was ready to make the jump from prototyping redesigns to working for a magazine in-house. The hustle and bustle of a newsroom was intriguing, and I was looking forward to collaborating with artists and editors on solutions to design problems. My first magazine job was a long-term freelance position with The New York Times Magazine, followed by shorter gigs at New York Magazine and Bloomberg Businessweek, before completing my New York City run as Art Director for Condé Nast Traveler. SPD: How did you first hear about SPD? RM: I was aware of SPD in school, but it wasn’t until working at Condé Nast that I became a member and started regularly attending events including the Gala. SPD: Where do you go to for inspiration and who are your mentors? RM: Flipping through my favorite magazines and design books is always a good starting point for me, while Pinterest and Designspiration are a couple of websites I visit often for inspiration. Other than that, going through my saved images on Instagram or going through my collection of obsessively organized files does the trick. As for mentors, in addition to Luke Hayman I am proud to call another Pentagram partner, Paula Scher, a mentor as well, while Arem Duplessis was instrumental in helping me find my footing in the magazine world when I joined the Times. Chin Wang, my Creative Director at ESPN, has been amazing as she has combined brilliant design feedback with advice on becoming a better manager and team leader. SPD: What are your favorite magazines right now and why? RM: The New York Times Magazine and Wired (US and UK) are my three favorites. 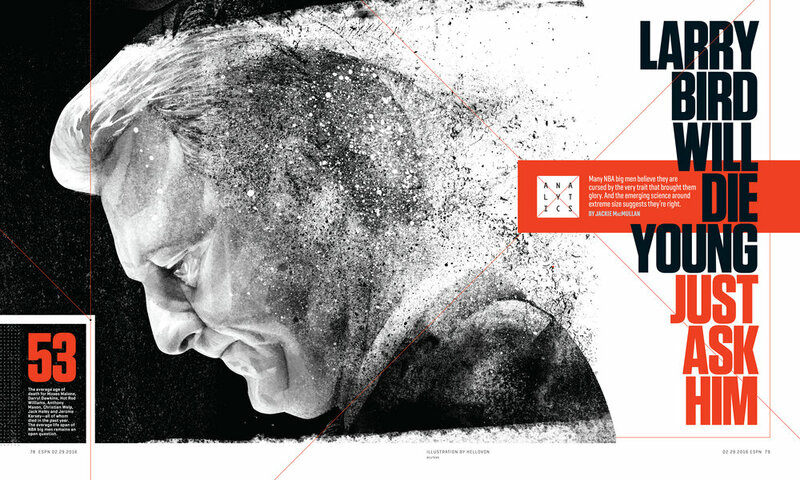 The combination of design, photography, and illustration of the highest caliber is a joy to flip through. SPD: What have you been working on lately? M: It’s been a busy few months leading into summer. 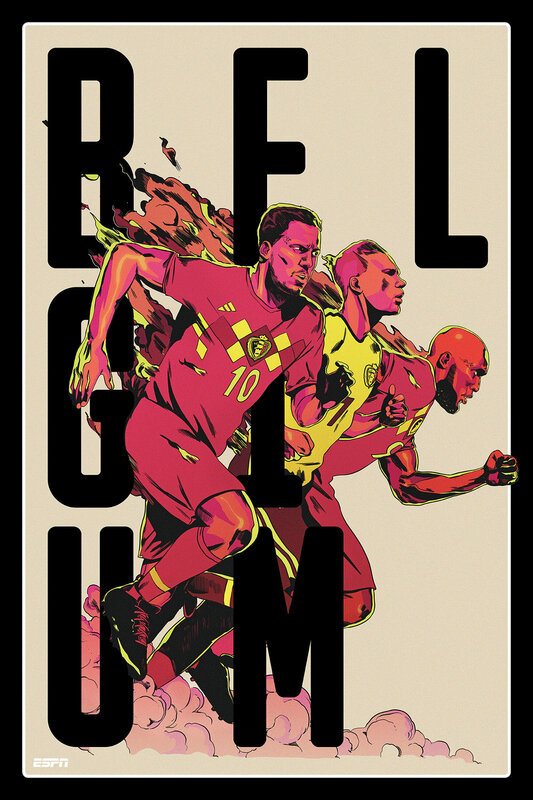 For the World Cup, I commissioned ESPN’s official posters, a tradition going back almost a decade. This time around, we opted to narrow the focus of the posters by creating four categories and cherry-picking the most intriguing teams. I worked on these posters with illustrator Paul Lacolley, who just so happens to be French and is still giddy about his team winning the World Cup. Shortly before that, I art directed both the print and digital versions of the World Fame 100, ESPN’s annual ranking of the most famous athletes across the globe. Jordan Metcalf drew the logotype and created a custom numeral set for us, while Erik Madigan Heck and Williams & Hirakawa photographed our four cover subjects. My current focus is a custom site that will serve as a companion piece and promotional tool for an upcoming basketball documentary series. SPD: You’ve been with ESPN for close to three years now, what’s it been like designing for the various platforms (print, digital, video, social media, etcetera)? RM: It’s amazing being able to conceive a design system for our magazine and then having control of the application of that same visual thinking across different platforms. The number of outlets your design work can travel to here at ESPN is daunting, and definitely forces you to think ahead to most appropriately develop your work to reach its full potential. For tentpole projects, which have the widest reach, the designs created for the magazine will inform the mobile and desktop solutions on the digital side, while I would collaborate with broadcast, video, and social media teams among others to ensure consistency and quality of the design work across those platforms. SPD: What’s the design process like for covering major sporting events and classic ESPN tentpole projects? RM: On the magazine side, the biggest difference between the two is the amount of time spent concepting and designing the issues. Major sporting events are folded into our themed issues, for which we have about 3 weeks on average to concept and design. On the other hand, tentpole projects often get produced months in advance as they are a bigger company priority that feature more original photography and often more nuanced (read: time-consuming) design solutions. SPD: What’s your favorite thing you’ve designed? RM: Our NBA Analytics issue is my favorite issue I have worked on while here at ESPN. Combining basketball (my favorite sport) and analytics (which I am fascinated by) made this a passion project for me. Working with illustrator/designer Michael Brandon Myers on a design system for the issue and commissioning one of my favorite artists, Hellovon, to illustrate several feature openers, was a special opportunity. SPD: What does SPD mean to you? RM: SPD has been an invaluable resource for me. Whether it’s the networking it enabled me to do or the things I’ve been able to learn through lectures and other events, it is really inspiring being part of a community of editorial design leaders.